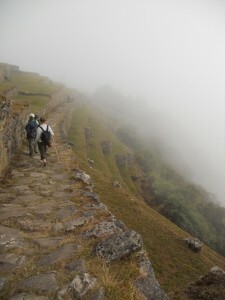 It was still misty when we entered the site of Machu Picchu. The only real indication that there might be something different, around us was the sudden absence of foliage, which had given way to orderly terraces. 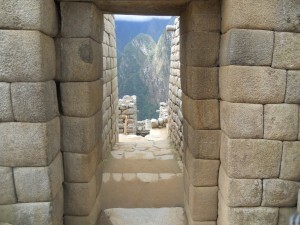 What we couldn’t see was the arching complex of building and walls, walkways and aqueducts. It wasn’t until we walked out to the edge of a giant rock pulled, out the binoculars, and peered down into the mist, that the familiar shapes, filed in our brains from the pages of textbooks and travel programs, began to emerge. 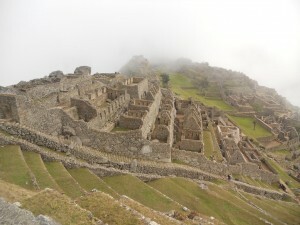 While the mist thinned under the rising sun, we explored the upper terraces. The irregular rocks were fitted expertly into each other, forming tall, solid terrace walls. 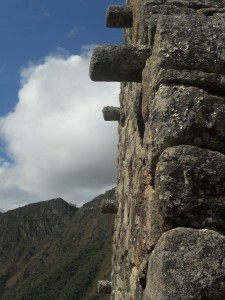 The only rocks protruding from the sides were there by design – steps to climb from one level to the next. The grasses were short and thick, and scattered with piles of smooth black pellets, evidence of the llamas that inhabit the ancient site. Before entering the lower site, we checked our packs, and looked for Kelly, our fellow-traveler who had stayed behind in Cuzco while LeAnna and I hiked the trail. We’d planned ahead of time to meet at the main gate. But we were late, and Kelly was nowhere to be seen. After about 20 minutes, we checked with Odon, who called the tour office to check for messages. Then we called the hotel. Nothing. I even tried to see if we could cross reference ticket numbers to determine if she’d already entered the site. No luck. I loaded a small pack for the 6 hours we’d spend inside the site, making sure to pack my binoculars. They might be our only hope of finding that day Kelly. 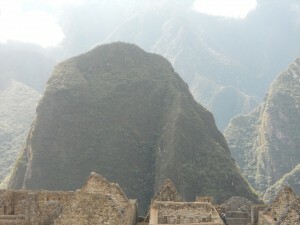 Then we reentered Machu Picchu, the sun beginning to stream through the clouds. The site was massive. Odon served as our guide for the first two hours. 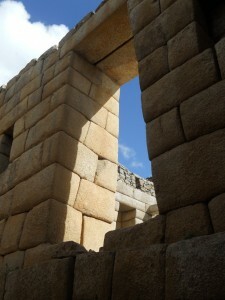 He took us through the noble houses, where the stones were smoothed from the rough-hewn blocks that made up the majority of the buildings, and then into the sun temple, where the stones were polished even further, indicating the deeply sacred nature of the space. 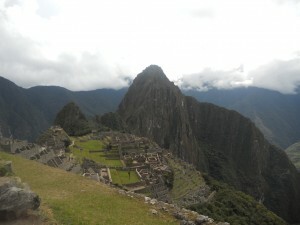 One theory about Machu Picchu is that it was the city of the Inka. 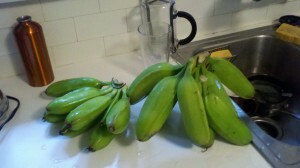 Like, THE Inka. The dude in charge of the empire. 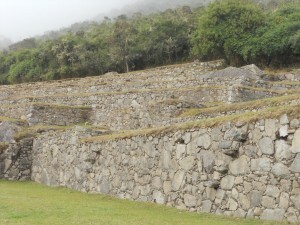 That this place was where the most sacred priests lived, and where the family of the Inka lived. Nobody really knows, but there are a lot of temples there. 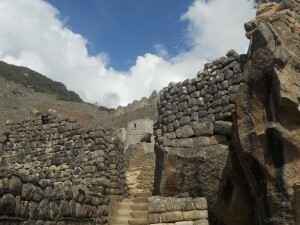 There was the Sun Temple, climbing organically out of a large rock base in the middle of the site. 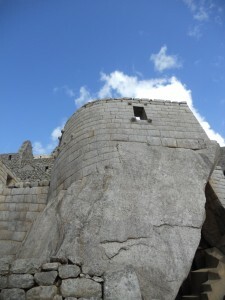 The temple of the Condor, where blood would be fed to the condor through the little hole at its beak that leads to an underground cavern (the stomach), which would hold the rest of the offering. with it’s sacred sundial (which was damaged during the making of a car commercial – for real). 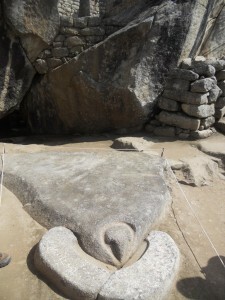 Machu Picchu is home to a number of other sacred rocks. Those that look like the actual sacred mountains that surround them. 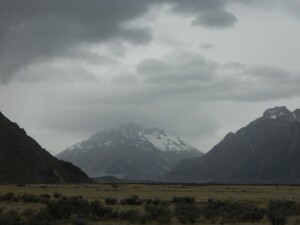 The sacred rock is in the lower right hand corner, mirroring the shape of the mountain in the middle. Rocks that, when lain upon transfer the energy of the earth. And those that, by their energetic makeup are believed to impart power to individuals who touch them. 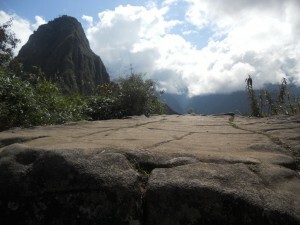 One such rock sits at the base of the trail to Huayna Picchu, the tall spire of a mountain at the back of the site. 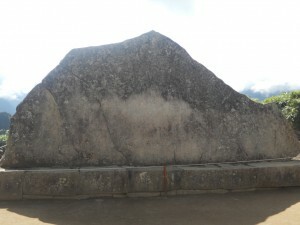 The stone, which shows visible sign of centuries of human hands touching its surface, is part of a resting area, a meditative retreat believed to help prepare travelers for the difficult hike to the top of the mountain, and the Temple of the Moon. Odon warned us against touching the stone. “You have to have the right makeup – the right energy.” He told us that the high quartz content of the stone could make you feel sick if you weren’t ready for it. Nobody in our group saw the Temple of the Moon, not because we didn’t want to, but because the government has greatly restricted the number of people who can climb the trail each day. 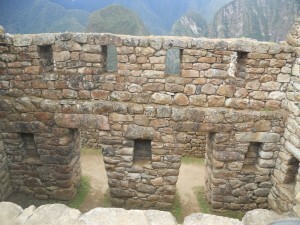 In order to get a ticket, you have to be at the Machu Picchu gates around 5:30am. 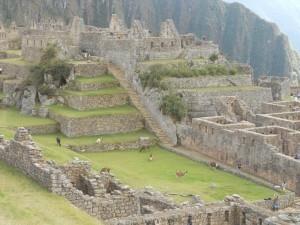 So we were relegated to the lower site, with its llamas and terraces. 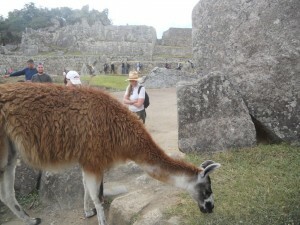 At one point, one of the llamas, who roam free throughout the site, stepped across the path, separating our group for a good 5 minutes, before it decided to move along. One of the women in the group called to those of us nearest to just move past it. The guy next to me looked over and said, “You go ahead. 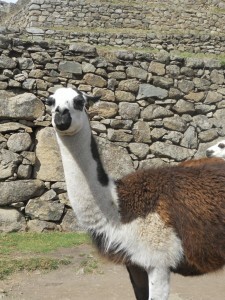 I raise llamas. I have no intention of getting kicked in the head.” So we waited until we were allowed to move to our next stop. While we walked, we were constantly scanning the site for Kelly. She was there somewhere, in a straw cowboy hat, and a red backpack. I was quite certain we could find her, if we kept the binoculars handy, and kept a steady eye out for her. But the pure vastness of the place, with its sharp turns and steep angles made it difficult to see much. To make matters slightly more challenging, Odon informed us that, very soon, 10,000 new visitors would be arriving, making it virtually impossible to find anyone. Just as we were winding down our visit, deciding that we’d be more likely to find Kelly in the tiny streets of Aguas Calientes, the town at the base of the mountain, I spotted her through my binoculars. “No way. She’s there!” Climbing the steps to the main temple, Kelly’s hat and backpack made her stick out. LeAnna and I ran through the site, (until we were stopped by guards) catching Kelly’s attention, ugly-American style, by jumping and waiving from below the temple. Of course she did. It was the thing that made the most sense. 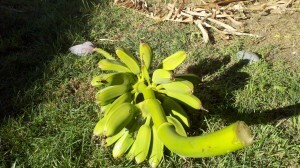 And the one thing we hadn’t checked. Brilliant. 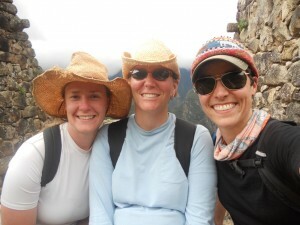 As it turned out, Kelly, unable to make the three-day trek with us, had scored one of the coveted tickets to the top of Huayna Picchu and the Temple of the Moon. We compared notes on what parts of the site we had seen, and made a plan that would take us through the rest and get us on a bus to the town in time for a final meal with our group. 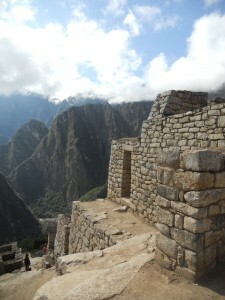 Even so, Machu Picchu, with its temples and stones, revealed nothing of its secrets to us. None of us became shamans. None of us had life-altering visions. But we did find each other. 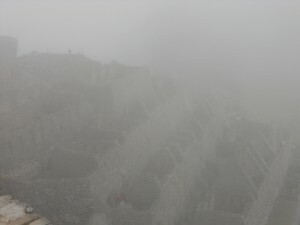 Amid the mysteries, in a spot of sunlight, we saw each other, before the mist returned to blanket Machu Picchu once more. 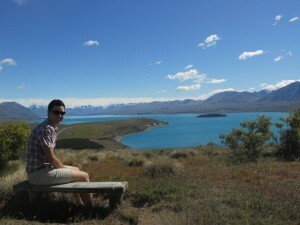 Our last major destination in New Zealand was Lake Tekapo, the lake right next to Lake Pukaki. 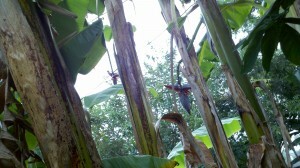 The day, unlike the last few, started out grey, threatening rain the entire morning. After a quick lesbian-saves-the-day moment when we changed the tire of a stranded German student, we hit the road, out around Pukaki. In the mist, the blue of the lake melted into the skyline. The water was tempting. Really, really tempting. Bouncing like a little kid, I kept asking when we could go for a swim. Krista’s good sense and the cloudy skies kept me from throwing myself in from the side of the road. 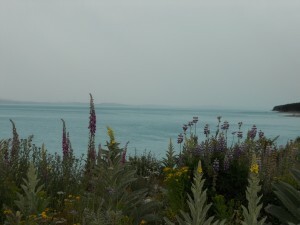 The mountains were gorgeous, the water was unearthly, and the lupine were overwhelming. 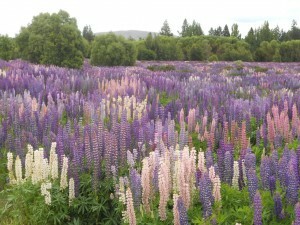 As we drove closer to Tekapo, the lupine fields increased in frequency and size. We’d seen the flowers throughout the trip. Every time we saw them, they seemed more intense. We found ourselves on the side of the road on countless occasions, Krista snapping away and me collecting seed pods. We arrived at the lake late in the day. W took a quick spin around the town, located some gluten-free pizza and filled our propane tank. Our night at Lake Tekapo was a rough one. Although we were able to find a secluded place to bathe in the lake, we were challenged mightily when it came to finding a place to sleep. The Department of Conservation campsites, which had been so good to us for two weeks were nowhere to be found in the Lake Tekapo area. On the suggestion of a shopkeeper, we headed to a nearby lake to check out a pay-to-play campsite. 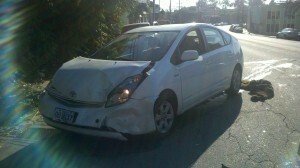 We ended up doing no more than a drive-by. The boarded up trailers and vacant weekend homes weren’t encouraging. 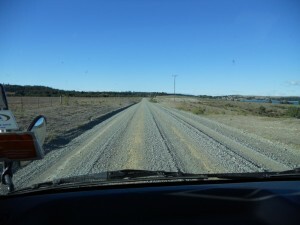 Next, we drove around the other side of Tekapo, headed toward an off-season ski resort, and hoping to repeat our experience at Cardrona. Instead, we were met with nearly unnavigable gravel roads, and no sign of a place to camp. Eventually, we found a nook. A tiny gravel pit dug into the hill below the road. We parked next to the solo evergreen tree, towering 20 feet in the air. We thought this would be the most protected location for us, until about 2AM, when the wind, howling across the lake, and shaking our van, threatened to take the tree down. Several van moves later, we found a level spot approximately 20 feet away from the tree, facing into the wind. After that, the rest of the night was tolerable. We were able to sleep, unafraid of being crushed in our sleep. 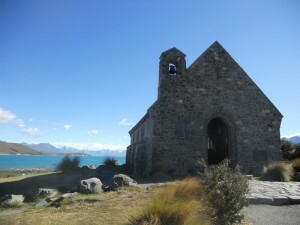 Lake Tekapo is best known for its chapel. The Church of the Good Shepherd sits on the lake’s shore, giving the congregation an amazing view. 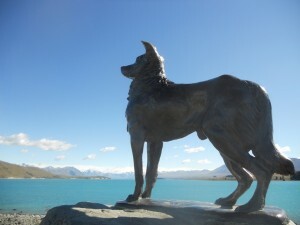 We spent a bit of time in the chapel and on the shores, inhaling the delicate honey smell of the lupine, and admiring the working dog memorial. 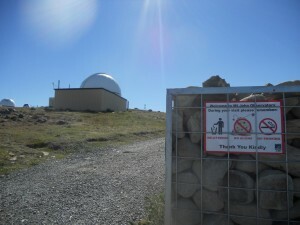 We ended our trip to Lake Tekapo at the Mount John University Observatory, high above the lake, the town and the valley. High, meant windy, however. 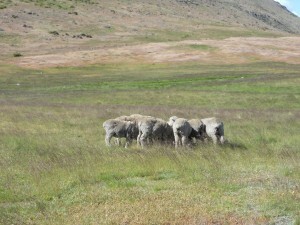 Even the sheep were huddled and sheltering from the cold. Leaving our aliens in the car, we walked around the campus. Up above, we were treated to a panoramic look at the area. We had a side-by-side comparison of lakes fed by glaciers and those not. We had a view of vast lupine fields. We had a view of the distant mountains. For the last time, we took time to sit and take in our surroundings. With the wind blowing around us and the sun beating down on us, we were enveloped in New Zealand. We left the observatory filled-up and grateful once again for all we had received on our trip. We would leave the next day for the states. But New Zealand was unlikely ever to leave us.